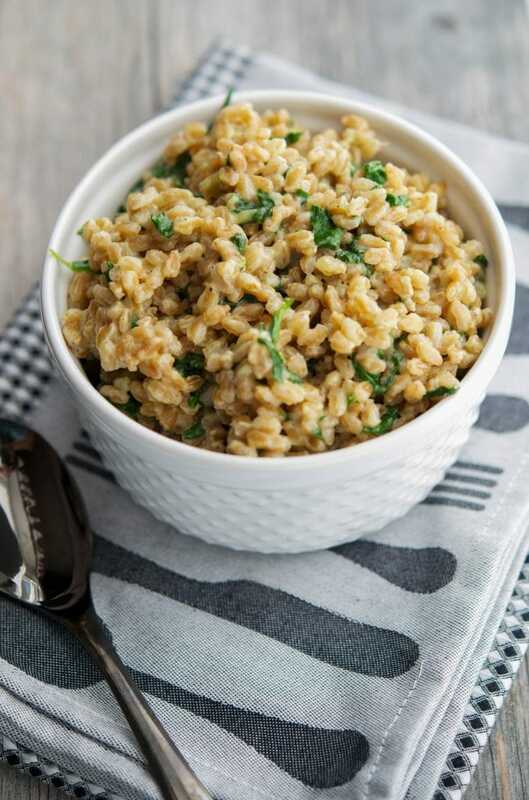 Italian whole wheat farro combined with fresh baby spinach, garlic, Asiago cheese and butter; then served as a warm side dish. 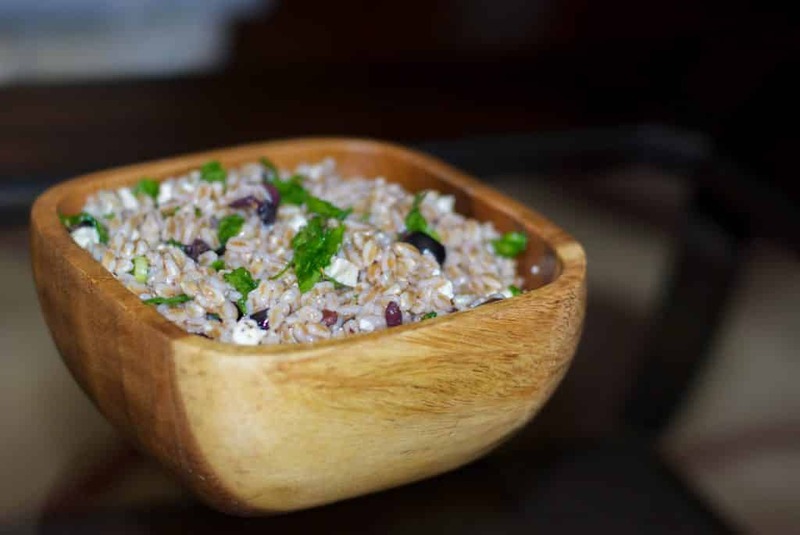 Have you ever tried farro before? 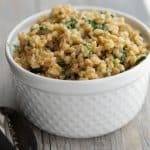 It wasn’t something I ate growing up until recently when my family and I visited my Aunt and Uncle for dinner one night and my Aunt Bonnie made a warm side dish of farro with spinach, garlic and Parmesan cheese. My family LOVED it! So when our oldest daughter was heading back to college after winter break, she put in a request for me to make it. You know, struggling college student and all and I was happy to oblige. I didn’t have an exact recipe so I winged it as best I could and came up with this Creamy Farro with Spinach, Garlic & Asiago. Of course, I had to taste some before I packaged it up for her to take back to school and it was wonderful, with a slightly different flavor since I used Asiago instead of Parmesan. My only regret is that I didn’t make more for the rest of us to enjoy! 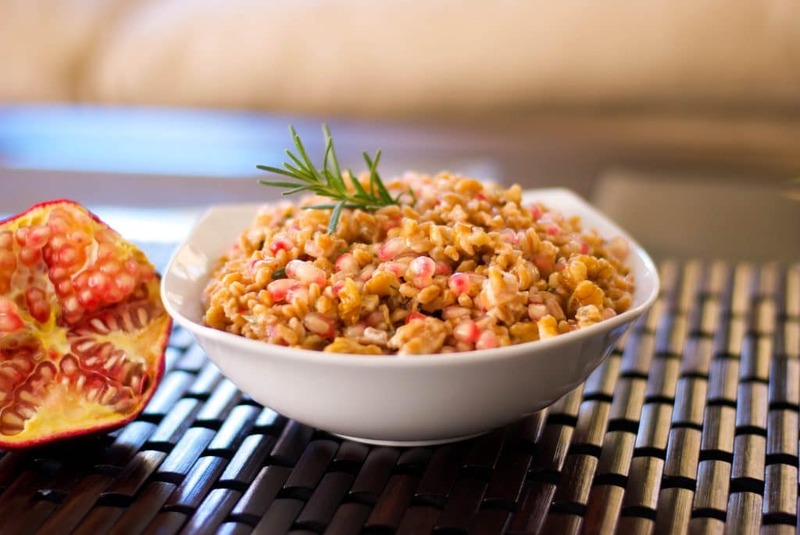 If you have never tried farro; which is the Italian name for wheat, it has been grown in Italy for centuries and can now be found in North America as well. 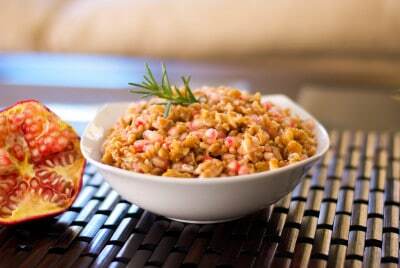 Farro has a nutty flavor with a chewy texture and is healthy too! 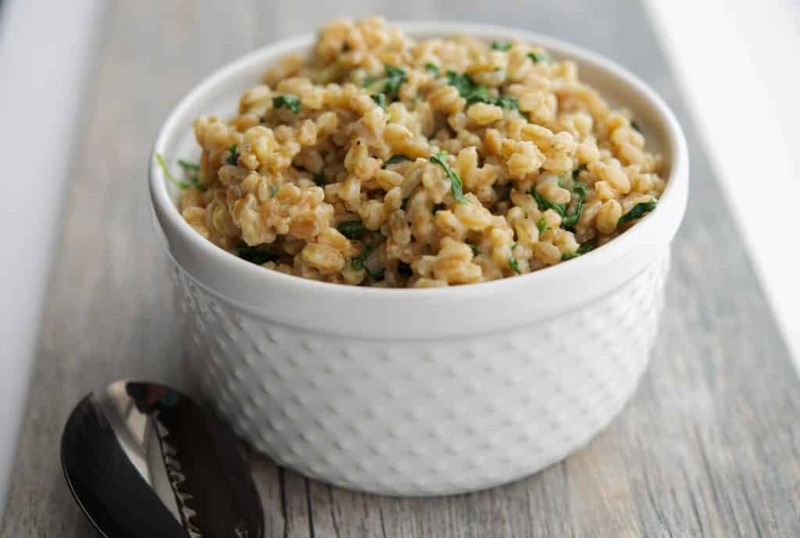 Creamy Farro with Spinach, Garlic & Asiago was delicious and tastes best when served hot or warm as a side dish. (I even think my Aunt would approve…I hope! ), but knowing my daughter, she probably just reheated it and ate it for lunch or dinner ‘as-is’. I also like that this recipe can be ready in under 30 minutes; which is a real time saver during the week. ~Enjoy! Add the farro and water to a saucepan and bring to a boil. Cover and reduce heat and allow to simmer until the water is absorbed; approximately 15 minutes. (Depending on the type of farro you use, cooking time may vary). Tear the spinach leaves and add them to the pot along with the garlic, cheese and butter. Season with salt and pepper as desired. Serve hot or warm. I haven’t seen Farro in the supermarkets or markets here in Australia but I will be keeping an eye out for it, until then I might try this with Freekeh and see how that goes. Thank you Claire. I’ve never tried freekeh so I’m not sure if it’s the same texture as farro, but with the addition of the other ingredients I’m sure it will taste fine. You might want to try it with rice too. Enjoy! Hi Claire, I’m so glad you liked it. Thanks for stopping back to let me know. Have a great weekend! I just made this as a main course tonight . Farro took a little longer and I had to drain mine. While it was out of the pan I sauted the garlic in the butter. Added the farro back in and slowly added the spinach in. (Thank you for putting the spinach in ounces). Stirred in cheese and seasoned. Very good. I only had fontina and Gruyere. Was perfect. Thanks so much. I’m so glad you liked it and I bet the combination of those two cheeses tasted wonderful! Thanks for coming back to let me know! I made this as a side with Pecan Honey Mustard Salmon. My husband and I liked it very much. I too, had to drain my Farro, and I used less spinach (all I had on hand). I think for the next time I will slightly increase the amount of cheese ? This is delicious! It has become a favorite, especially on long work days. I will add sausage to use as a main course. My husband looks forward to having it for dinner. I love this dish, I have made it several times. I used arugula once when I was out of spinach, similar taste. What is the nutrition information ? I notice you have the kcal listed, how many servings are in this recipe? Thank you. Hi Zlata, I’m so glad you enjoy the recipe.I’ve added a nutritional label to the recipe for you; though it is based on the specific ingredients I used so it may not be 100% accurate. This recipe serves 4 people (1/2 cup servings). I made this and poached an egg to put on top of it to make it a main course. It was amazing!! This is definitely something I will make again. Thank you! I’m so glad you enjoyed it Jamie! Hey, can I use frozen spinach? Don’t have fresh!! Sure, that should work fine. Enjoy! 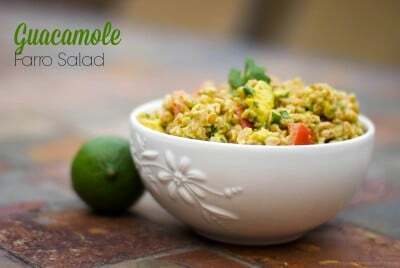 can this be made ahead and frozen in meal prep? it looks REALLY good! To be honest, I’ve never frozen it so I’m not sure how it would be once defrosted. I have prepared it the day before serving; then reheated and it was fine. If you do try freezing it, please stop back to let me know how it turns out.